If your business has a flat roof (which many of them do! ), you’ll need to take special care of it throughout the year. They are inherently different from pitched or sloped roofs, and therefore pose unique challenges. That’s mainly because leaves and other debris tend to collect on them, leading to structural issues that can threaten your building. Staying on top of regular maintenance should be enough to keep your flat roof in tip-top shape. But if you see an issue, it’s wise to enlist the help of flat roof specialists to inspect the situation and make the repair. Here are some tips to care for your flat roof. Keeping these components clear is of paramount importance. If debris is allowed to build up, it could trap standing water on your roof. That’s when leaks happen. Low hanging branches can scrape the roof, so trim them or remove them entirely before they can cause damage. Every so often, sweep debris off the roof to alleviate all that extra weight that can put stress on your structure. While you’re up there, check the flashing for cracked caulking, which you can remove and replace. Also, be on the lookout for large cracks or splits in your flat roof, as well as punctures or worn spots. Small punctures you may be able to patch yourself. Large ones need professional attention. You should have your roof inspected at least twice per year, in the spring and in the fall. Hiring a roofing professional to do this will alert you to potential issues with your roof so you can stay on top of repairs as needed. Neglecting your roof will only detract from its life span and lead to more costly fixes later on. Ponding Water: This is accumulating water that does not evaporate or disappear within two days of drying conditions. If not taken care of right away, your roofing system can fall victim to membrane degradation resulting from exposure to magnified UV rays, accelerated heat aging or the presence of algae. Blistering: This looks like raised strips on the surface of your roof. Liquid can get trapped between sections of membrane, then expand and contract, causing leaks and cracks. Cracking: UV rays can break down the membrane and cause cracking; other times, poor workmanship is to blame or even surface stress caused from too much weight on your roof. Loose Fasteners: When fasteners become loose, they can’t properly anchor the roofing system to your building, leaving your roof vulnerable to wind damage and potential tear-off. 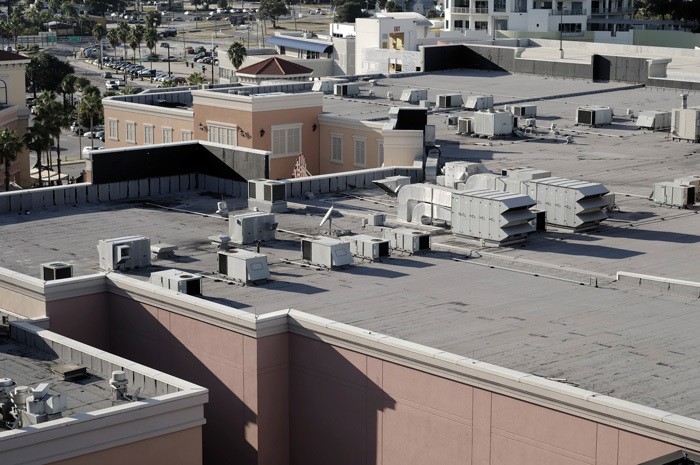 We offer Fort Worth commercial roofing inspections and repairs as your flat roof specialists, so schedule your appointment today by calling 817-769-2477.